Curtis McGee is a premier trainer and fitness expert who has dedicated his life to sports and fitness. He lettered in football, asketball, and track during his four years at Leuzinger High School. He was awarded a scholarship to Utah State University where he majored in Communications and minored in Physical Education. During his education there, he found the time to add acting and the office of Vice President of the Black Student Union to his list of accomplishments. Upon graduation from college, he had a rewarding stint in modeling. 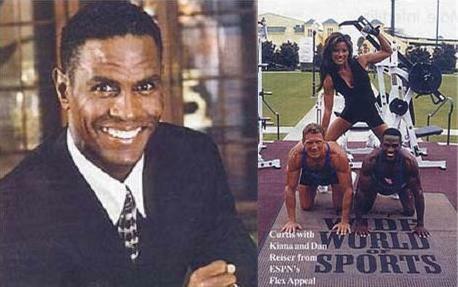 Nike selected Curtis for their cross-training campaign with fellow athletes Bo Jackson and Deion Sanders. To his modeling credits are companies such as Nordstroms, American Express, Alaskan Airlines, Columbia Sportswear, and The NFL. In the 1996 basketball movie "Sunset Park" starring Rhea Perlman of "Cheers", he was featured as a referee. Curtis has been involved in community affairs. In 1992, he was honored as Oregon's Man of the Year. It was during this time that he became a performace consultant for J.R. Harris and Brad Marshall Sports Marketing Agency. His professional clientele have included a list of notables from the NFL, NBA, MLB, and WTA. With Kiana Tom, he was a member of the four-person cast of ESPN's Flex Appeal which aired five days a week. Curtis has gone on to train tennis star Anna Kournikova who he appears with in Anna's workout video "Basic Elements". He recently established McGee's Fitness Challenge at Florida's exclusive Belleair Country Club. Curtis currently conducts a series of Fitness and Financing workshop seminars that gives personal trainers the tools, strategies, and insight to take their businesses to a whole new level.